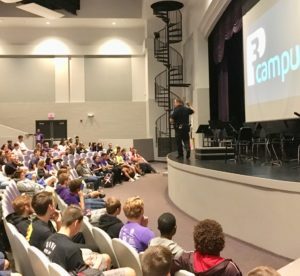 Collinsville High School Student Resource Officer Mark Terveer introduced the P3 Campus app to CHS students in a series of assemblies during the school day on August 24, 2018. P3 Campus is an anonymous tip reporting platform where students can report a wide range of concerns, from mental health issues to threats of violence. The P3 Campus is accessed via an app downloaded on a mobile device or through the P3Campus.com website. The CHS P3 Campus will be monitored 24/7 by the Student Resource Officer (SRO). The tips that come in are 100% ANONYMOUS. “The only way I know who you are is if you tell me or if I go to a judge to be granted a subpoena to obtain the records,” said Terveer. When a student submits a tip, a number is assigned so the student’s identity is not known. He assured the students that P3 is not a “snitch app” — it’s a way to help friends who need help and to keep the school community safe. Once a report is received, Terveer explained it is forwarded to the appropriate resource. Issues requiring intervention from law enforcement will be investigated, while tips requiring social/emotional support will be forwarded to school counselors and social workers who can offer assistance or referrals. Some tips will be forwarded to school administration for follow-up. Students who have an urgent situation to report should contact local law enforcement or call 911. The Collinsville High School P3 Campus was made possible by a donation from RE/MAX Alliance.